If you believe the metaphysical and healing powers attributed to Aventurine, you’d never be without this stone! Just for starters, Aventurine is said to benefit creativity, prosperity, perseverance, courage, luck, friendship, and physical health. In its green form, Aventurine is associated with the heart chakra, your healing center and the wellspring of love, joy, and compassion. A member of the quartz family, Aventurine commonly appears as green, ranging from light to dark shades. There are other colors (blue, for instance, and white, red, yellow, and peach), but their healing attributes differ somewhat, and green is thought to be the most powerful form. The name Aventurine comes from the Italian for “by chance” because of its accidental discovery by Venetian glass workers centuries ago. It resides at 7 on the Mohs scale of hardness and is found throughout the world, including Brazil, Chile, India, and Russia. Often mid-identified as Malachite or Jade, Aventurine is typically cut into cabochon, ornamental objects, or drilled gemstone beads. Humans have appreciated Aventurine for more than 2.5 million years. Primitive man used it in his tools; ancient Tibetans adorned the eyes of statues with it to enhance their visionary powers. 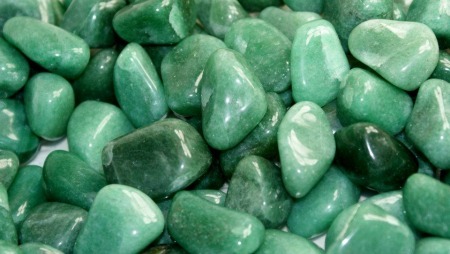 It’s said that Aventurine enhances the connection between you and your guardian angel or spirit guide. It calms a troubled spirit, imparting a sense of inner peace. Feng Shui practitioners suggest placing Aventurine in the east or southeast area of one’s home to attract abundance, or whichever room a new project is about to begin. How do I use Aventurine? This entry was posted in Sunday's Gem and tagged aventurine, gemstone properties, healing gemstones, lucky stone. Bookmark the permalink. The color green is pleasing to me since my birthstone is the Emerald. I need to get some Aventurine to use in launching book. Good post, Debbie. Ha ha ha. I’ll keep working on the yarns. What a gem. I love the color. And your right! 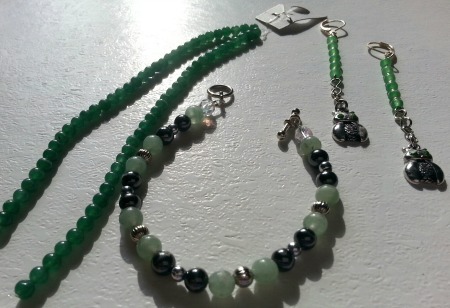 Why wouldn’t you add a piece of Aventurine to your home and pocket and any other place you spend a lot of time. The lottery tip is a good one too! I don’t buy lottery tickets, but if I did, I’d have some Aventurine on my person! It’s referred to as the “gambler’s stone,” so maybe I ought to. I’m enamored of anything green, so this one’s particularly lovely to me. You know, I believe my mother had a necklace of aventurine beads. They were close to the color of those in your bracelet, up above. I have no idea what happened to it, and now I wish I had it. I knew (or thought I knew) that the beads were stone, but I didn’t have a clue about their identity. It was a beautiful thing — gone down the great maw of time! I love the color of these. I’m not even sure I knew the name was aventurine. I would have called the color seafoam. It’s one of the colors of Caribbean waters — and goes so well with the turquoise waters there. I had a ring belonging to my late grandmother that was stolen when our house got broken into. Doggone it, it wasn’t very expensive, but I’d sure like to have it now. And to think it was probably pawned off some place is aggravating. I’m a BIG fan of green, FF! Doing research for this post, I was surprised to see how many different shades of green Aventurine comes in. The pale green of my bracelet sharply contrasts with the darker green of the strung beads. Perhaps that’s part of Aventurine’s charms…its variety in palette! Keep it as a worry stone? Will it absorb my worries? It’s sure a pretty stone. Something tells me having a security blanket is helpful even for adults, Barb! And if mindlessly fiddling with an Aventurine (or another stone of your choice) eases fears or worries, that feels like a good thing to me. Isn’t there something to be said for activating the natural calming endorphins in one’s thumb?!! What a beautiful stone, Debbie. I was not familiar with this one at all. I could use some for creativity, for sure. I love the bracelet and earrings you made, they are really nice. Thanks for sharing the beautiful and interesting stone with us! Thanks, Lana! The bracelet is one I made a couple of years ago, but I still love it. Love how pale green these stones appear intermixed with the hematite. As for the earrings, well, they’re just whimsy. You probably can’t see from the photo, but these are little fat owls — with sparkly green eyes — dangling from the Aventurine. Debbie, I absolutely LOVE that quote! And I also love this post on the gemstone Aventurine, I know it well. Not only do i find it beautiful and powerful, but GREEN is my favorite color (as I know it is for you too) so I’m especially drawn to it. Yes, which is why it is so powerful in healing. And OH. MY. GOD…the jewelry you made using this gemstone is absolutely BEAUTIFUL! Honestly, my friend, you have a such a talent for creating jewelry. Thanks so much for sharing yet, another interesting and informative post on gemstones. Loved it! Ron, you remembered (about green being my fav color, too) — I’m honored!! Yes, I find myself drawn to most things green — except Lima beans, no way will I touch them! I guess LOVE is the ultimate healing force. No way can people, animals, or plants grow without it. Perhaps that’s why we all need a bit of Aventurine in our lives! I think of you when I see this gem now, Debbie. (even if I already thought of you when I saw green.) I adore the meaning you explained. Love heals, indeed. Hugs! Aw, gee, what a lovely thing to say, Audrey! You know I’m a BIG fan of most things green. And it’s true — love (and time) are great healers. Hope your week is going splendidly!! My guess is we all will take an abundance of both. All seems well thank you for asking. Thank you, Dawn. I think so, too! I think aventurine is also considered the “gardener’s stone”. A great quote, so true! Is that because it’s helpful in making plants grow, Suzi? I hadn’t heard that, but it doesn’t surprise me. It probably encourages flowers and such to become as pretty as it is!! I think it’s just because it’s green and gardeners tend to have “green thumbs”! Actually, when I read it it didn’t say why it was called that.